Researchers and engineers at MIT have worked together to develop a brand-new robot that might one day outrun human beings. 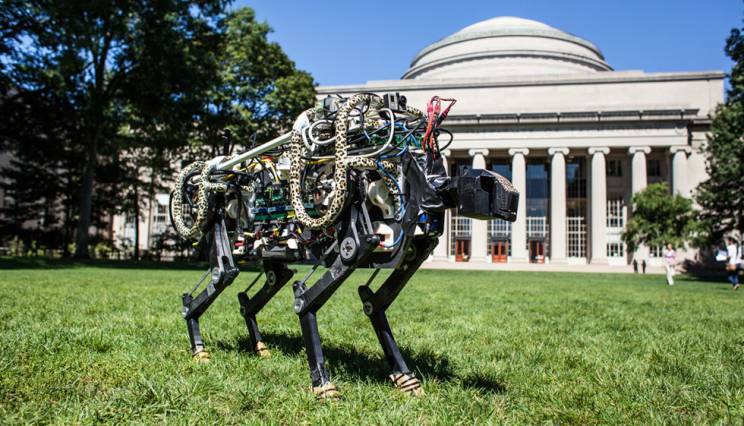 The robot, based on the aesthetics and properties of the cheetah, features an innovative algorithm that mimics the cheetah’s bounding gait, and has so far been shown to move at a steady 10 miles per hour. The robot can even use its cheetah-based bound to leap over small obstacles! These breakthroughs can be attributed to the new algorithm, which allows the robot to determine how much force to exert in each bound in order to maintain a constant speed. The robot can currently handle treadmill experiments and field tests on grassy hills, compensating for small bumps and obstacles and maintaining balance and speed. Researchers hope to push this technology even further, turning the robot’s speed up to 30 mph!